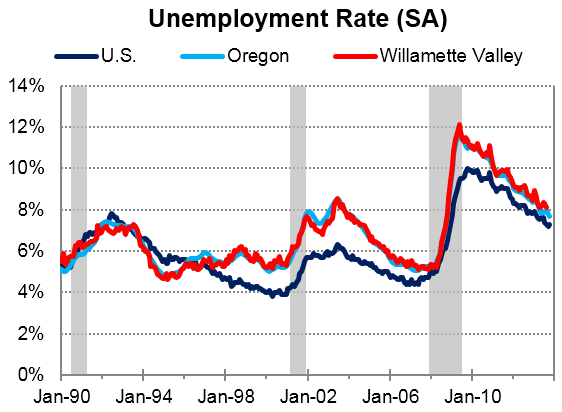 This post continues with our quarterly rotating series on the regions within Oregon (see the tab at the top of the page). In the December forecast document, our office covered the Portland Metro and Willamette Valley. Home to a wide range of economic activities – from metropolitan cities to college towns, from farming to wood products and from the Cascades to the Pacific – the Willamette Valley is the bellwether region in the state. Overall trends in these five counties match the statewide figures in recent decades. This is at least partially due to the stability provided by the region’s large public sector, with the state capitol located in Salem and two major universities in Corvallis and Eugene. 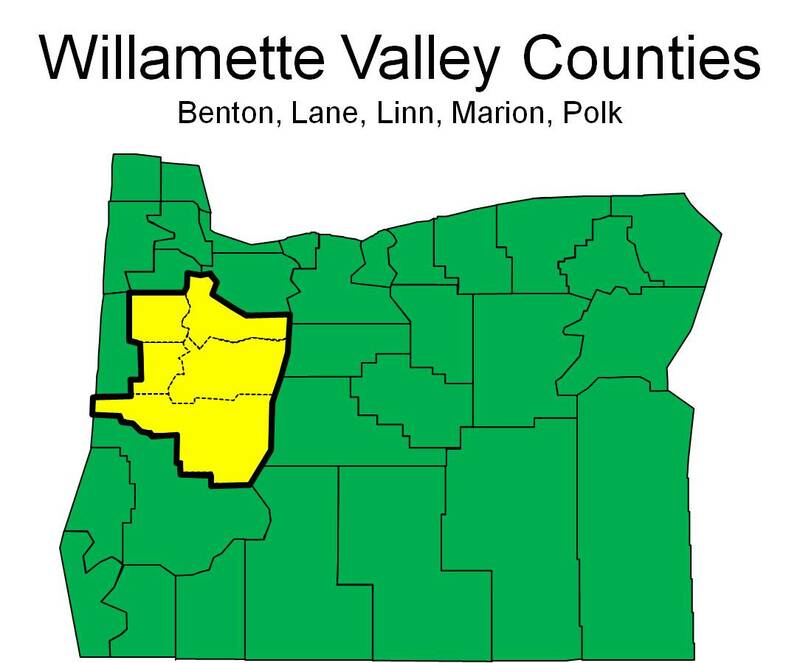 While the region’s dependence upon natural resource and goods producing industries has declined in recent decades, the Willamette Valley is still a key agricultural producer for the state. According to 2012 statistics, the Valley produced nearly 25 percent of all agriculture sales statewide, with key concentrations in grass seeds, small fruits and berries and poultry and eggs. Even as employment over the past decade is essentially flat, like many regions in the country given the severity of the Great Recession, the industrial mix has transformed with strong growth in service sector jobs. In particular the Valley has seen employment gains in professional and business, educational and health, and leisure and hospitality industries. It is important to keep in mind that not all of these are “bad” jobs and that not all aspects of job polarization are negative. 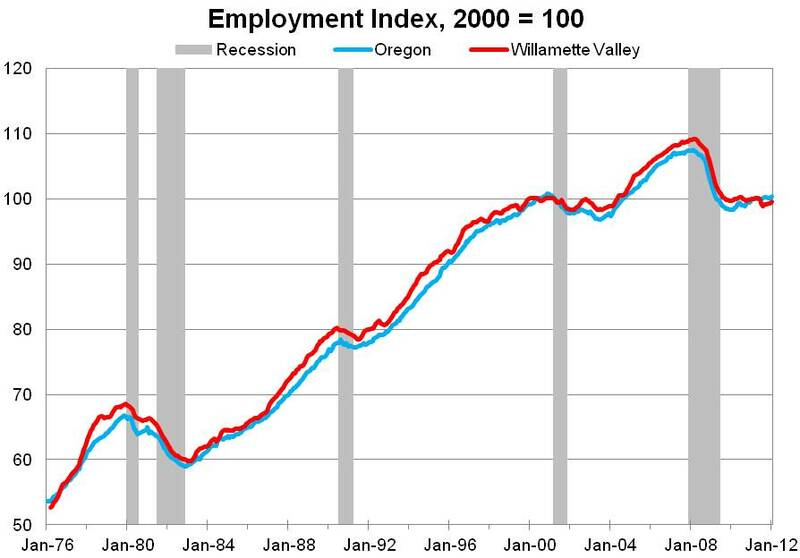 The Willamette Valley has a pretty balanced occupational mix and seen strong growth in both high- and low-wage jobs. Furthermore from 2000 through 2012, Corvallis, Eugene and Salem combined outperformed the state in middle-wage jobs with small gains in Upper Middle jobs and fewer losses among Lower Middle jobs. Some concern is given to the slow recovery in the Valley in recent years. 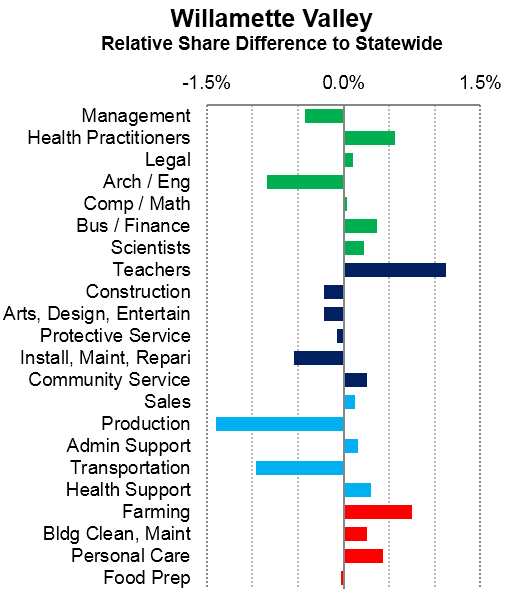 Employment growth has lagged, which is expected given the amount of public sector jobs. However population growth has been slower as well with gains of 1.2% from 2010-12 while the state gained 1.8%. These trends are important to monitor moving forward. On the bright side is employment in the Valley appears to have turned a corner in the past year or so with gains of around 5,000 jobs. This is certainly a welcome development after losing 8 percent of the region’s employment during the recession followed by no net job growth for more than 3 years. For more information check out the Employment Department’s website where you can find lots of great, local level analysis from the regional economists and workforce analysts. Salem is Region 3, Corvallis and Linn County are Region 4 while Eugene is Region 5.